CR-129. Konstantin Lapshin, piano. Schumann. Tchaikovsky - Pletnev. - Classical records - compact discs with classical music, CDs online shop. CR-129. Konstantin Lapshin, piano. Schumann. Tchaikovsky - Pletnev. "Konstantin Lapshin's performance gave me real pleasure. He's got a special edge in his performance, he makes the whole audience feel the music the way he does, because he has his own attitude to the piece performed. He has a lot to convey to the audience." Mikhail Pletnev, pianist, conductor, composer. "Konstantin Lapshin is an accomplished musician, with a unique artistic vision and strong personality. His playing combines all the brightest traditions of Moscow piano school: deep comprehension of the essence of the music and an ability to convey it to the audience in the most eloquent way; an acute sense of musical timing, which enables him to create large forms masterfully; very special and expressive way of communicating the music, which is revealed at its best in lyric music. Konstantin is a pianist of mature technique and refined taste. His insightful interpretation, sensitivity, exquisite sound and natural artistry make his playing highly compelling." This is how the famous Russian conductor, professor Eduard Serov described Konstantin's playing, and these are the reasons why he is so well received by the audiences, wherever he plays. Among the most important venues have been the Great, Small and Rachmaninov Halls of Moscow Conservatoire, Cadogan Hall and Purcell Room in London, Bridgewater Hall in Manchester, Salle Cortot in Paris and many other halls in Europe, Russia and the USA. Konstantin began his music education at the age of five. After finishing Gnessins Music College, he became a student of Moscow Conservatoire (class of Professor Lev Naumov) and graduated with distinction. Having completed a post-graduate course (class of Professor Mikhail Voskresensky), Konstantin won a scholarship to continue his studies in London with Vanessa Latarche at the Royal College of Music. The ABRSM (Associated Board of Royal Schools of Music) played an important role in supporting his studies. Konstantin's talent and mastery have been recognized at many competitions, including international ones, where he became a prizewinner or winner. Among them are Schubert International Piano Competition in Dortmund, Maria Yudina International Piano Competition in St. Petersburg, Rachmaninov International Piano Competition in Moscow (special prize), the Gnessins International Piano Competition in Moscow, the International Piano Competition In memory of Lotar-Shevchenko in Novosibirsk, and the Haverhill Soloist Competition. While studying at the Royal College of Music, Konstantin won all the piano competitions held by the College, including the most prestigious Chappell Prize, as well as the Beethoven Competition, Schumann Competition, Concerto Competition. Konstantin has received high acclaim from many famous musicians, like Mikhail Pletnev, Tamas Varsary, Richard Goode, Murray Perahia, Noriko Ogava. He has performed with orchestras under Peter Stark, Robin Browning, Nigel Wilkinson, Eduard Serov, Sergei Skripka and appeared as a soloist at international festivals Gradus ad Parnassum in Moscow, Musical Holidays in Piatra-Neamts (Romania), In memory of Lotar-Shevchenko in Novosibirsk, All Mozart Concertos in Volgograd with the Volgograd Symphony Orchestra, Chipping Campden Music Festival, Hatfield Music Festival, Bath Music Festival. 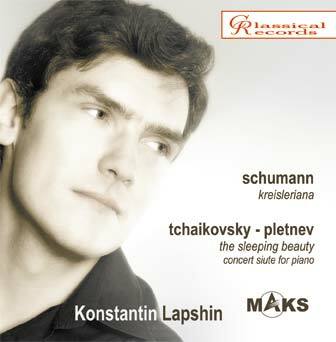 This CD includes two masterpieces of Romanticism: Schumann's Kreisleriana and the Concert Suite from Tchaikovsky's ballet The Sleeping Beauty arranged by Mikhail Pletnev (1990 version). Do you have any questions about CR-129. Konstantin Lapshin, piano. Schumann. Tchaikovsky - Pletnev. ?